Click on the following link to jump on particular section of this post. 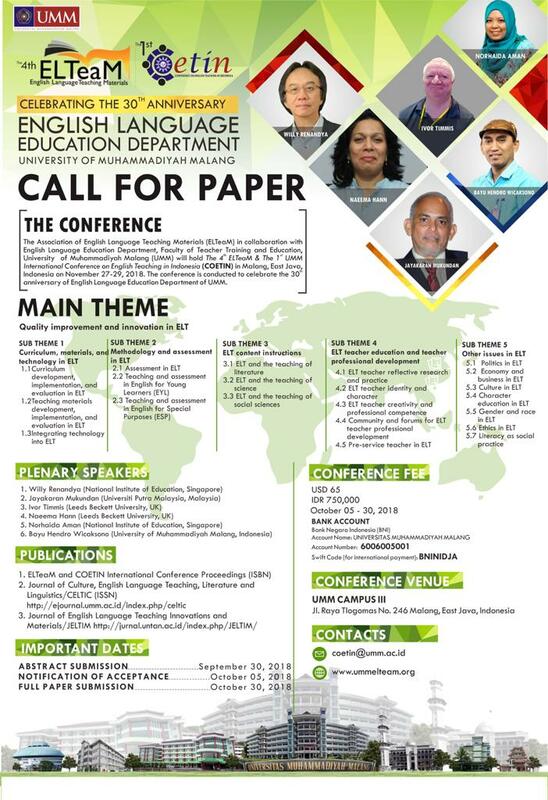 The Association of English Language Teaching Materials (ELTeaM) in collaboration with the English Language Education Department of the Faculty of Teacher Training and Education of University of Muhammadiyah Malang will hold The 4th ELTeaM & The 1st UMM International Conference on English Teaching in Indonesia (COETIN) in Malang, East Java, Indonesia, from 22-26 November 2018. The conference is also conducted to celebrate the 30th Anniversary (Dies Natalis) of English Language Education Department of UMM. Dr. Noor Doddy Irmawati, M.Hum. Prihadi Dwi Nur Cahyanto, M.Pd. Download the timetable right here.